We see a lot of different vehicles and engine combinations at the OPTIMA Ultimate Street Car Invitational, presented by Royal Purple and KN Filters. John Lazorack's LS-powered 1988 Chrysler Conquest is probably one of the most-unique we've encountered in six years of OUSCI events. Less than 11,000 examples were produced in 1988, most just a memory 25 years later. The Conquest and it's corporate cousins from Mitsubishi, Dodge and Plymouth do have a loyal following on Starquest.com, where John is a bit of celebrity. Part of that noteriety came from a full feature in Modified magazine and that continued as John competed in Modified's own street car shootout, where he popped onto our radar (and the cover of that issue). So with that introduction, let's learn more about John and his Conquest. John bought his Conquest when he was just 17 and used it as his daily driver in high school. In the summertime in his college years, he'd spend a few weeks at a time prepping the car for a new paint job but ended up parking it when life priorities took over. Once he graduated and snagged a job, he brought the car out of storage and took it to Detroit, to get it up and running again. After a few weeks of messing with it, he decided to tear it down and build the car exactly as he would want it. Lazorack gave himself no time constraints and had a budget of next to nothing with which to work. He completely stripped the car down to a bare chassis and started designing a roll cage for the car, built it digitally and had it formed by Art Morrison. A professional fabricator welded it in, as John had not yet learned to weld. As time moved on, Lazorack came across an orphaned LS1 from a C5 Corvette in a friend's garage and eventually talked him into selling it. To fit the engine into his Conquest, John started by cutting out the firewall, trying to get it as rearward as possible for better weight distribution. He had no scales to figure this out, just mounting it where he thought it made sense. It was almost a year after he dropped in the engine, that he finally saved up for a Tremec T56 transmission. Once he had the transmission, he went to work cutting out the entire center of the car to make it fit (it was much larger than he expected). This operation forced Lazorack to teach himself how to weld and as some of the pieces came together, John began to realize that he'd created a host of issues for himself by mounting the engine where he did. The steering system had to be re-designed now because of the location of the oil pan. John had planned on drifting with the car, so he re-designed the steering knuckles for better geometry and angle, built them digitally and then had them CNC'd at a local shop. He then had to tub the front inner fenders for tire clearance at full lock and once he had the chassis sealed back up, he started working on the interior. John hated the stock interior, so he thought a full re-design was in order. He wanted it to be light and clean, only having what someone would need inside the car (Conquests had lots of Knight Rider-esque knobs and switches). Lazorack did a lot of sketches, and built a few mock-ups, before arriving at his final design. In total, he spent over three years rebuilding the car from scratch. What started out being just a motor swap turned into a complete nut and bolt rebuild. Lazorack's goal was to build a daily driver that could be abused at the track, whether it was road racing, drifting or drag racing and then be driven back home. Four years and almost 25,000 miles later and John has been doing exactly that. So how will John and his Chrylser fare in the OUSCI? John will be the first to admit he doesn't have extensive driving experience outside of his Conquest. Having spent 14 years behind the wheel, he does at least know his own car fairly well. 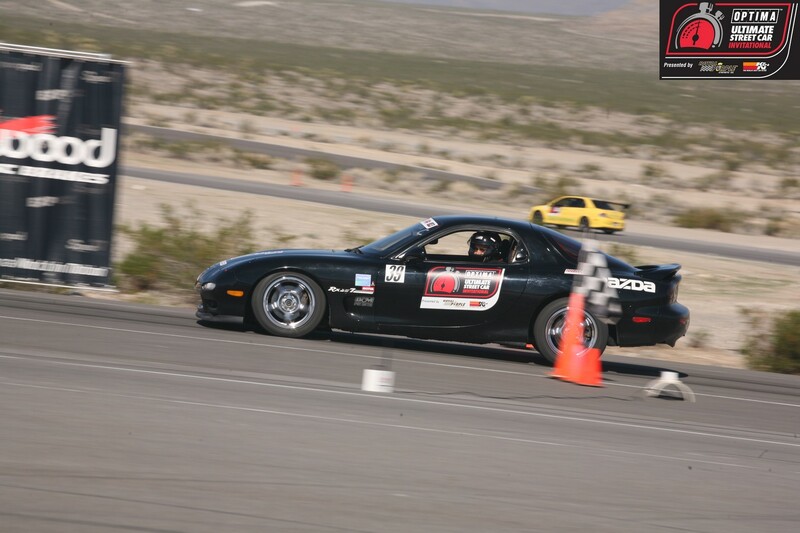 He learned to drift in the mountains of Northern California, where he attended college and he has also participated in occasional open track, drift and autocross events, which led to some amateur competitions, including Modified's event, where the Conquest placed first in the rear-wheel drive calss and third overall. "I believe that I will fare rather well in this event," said John. "I'm very familiar with my car and know how to drive it. I'd have to say everyone is considered good competition, considering I have about $10,000 total into my car, including the purchase price. It is an absolute honor to be involved in something like this and I couldn't be more excited! We're excited to have John in the event and we look forward to seeing him at SEMA and in the OUSCI.